Custom fit to Chrysler wiring specifications. Mopar wire connectors for the Jeep Wrangler minimize the need for wire splicing and feature a protective wrapping that guards against weather and abrasion. Feature high quality connectors, and relays as necessary. 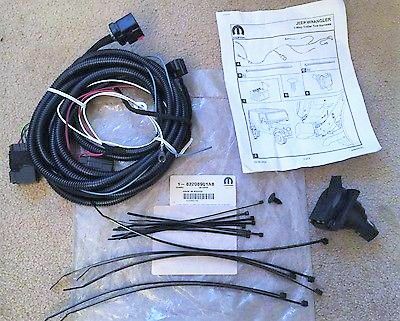 Trailer Tow Wire Harness Kits, with 7-way round trailer connector, plugs directly into the vehicle wiring, no splicing required. Please select LWB model year above. For 05-06 models follow the instructions which have you connect to the DRIVER side tail light. Run it down the frame and across the engine bay to the battery. It will work however your left and right directionals will be reversed on the trailer. You will need to pull apart the plug and switch the two wires. Use a multi meter to figure out which wires they are but mine were in opposite corners. One is yellow and one is green. Once switched everything worked perfectly. See pictures of wires. First off, since no one (not even Mopar) carries the harness for the '05 and '06 models anymore, and no one could answer what the differences between this harness and the discontinued harness are, I bought this just hoping it would work for my '05. Well, now I know what the difference is. And that difference means it is not plug-n-play for my '05 like I was hoping. Bottom line, this harness plugs into the passenger side taillight harness and the connector on this harness expects four wires to be there. But in my '05 model, the taillight harness plug is only populated with three wires. So, when installed by simply plugging it in, there is no output for the driver side stop/tail/turn. I haven't corrected this yet, but it should be relatively simple to splice in that fourth connection that this harness needs. Anyway, the harness itself is great. Plug-n-play simplicity. Just know that if you try to use it on an '05 (and probably the '06) model, you will have to do a bit of extra work.